During this trip you will get to know Java’s cultural highlights, such as the famous Borobudur and Prambanan temple along with an experience of wonderful nature and rugged volcanoes. Unwind at one of the many tea-plantations, witness the daily life of the locals, Discover the fascinating cultivation of the rice fields and the impressive Balinese Hindu temples and culture. Arrive Yogyakarta 4 Nights > Drive Malang 1 Night > Drive Bromo 1 Night > Drive Kalibaru 1 Night > Drive Ijen 1 Night > Drive Lovina 2 Nights > Drive Ubud 3 Nights > Flight Lombok > Drive Senggigi 3 Nights (Boat Trip Gili Island) > Flight Denpasar > Drive Sanur 2 Nights & Leave. Upon arrival in Yogyakarta Airport you are met and transferred to your pre booked Hotel. Overnight stay at the Hotel in Yogyakarta . During the Dutch colonial time, the plantation was in use and owned by a Dutch person. Nowadays, Losari is an Eco Resort surrounded by eight mountains. This is a place where you will find total relaxation. It has a very serene and peaceful ambiance and is surrounded by the coffee plantation. It has colonial and Javanese architecture and luxury facilities.The Hammam Spa is a wonderful nature experience. They do not only use the coffee beans for coffee, they also use it for products in the Spa, like coffee scrub.Overnight stay at the Hotel in Yogyakarta. Today you will visit the Borubudur, the world famous Buddhist temple. Close to the Borobudur there is the friendly and typical Javanese village of Candirejo. Supported by a local organization the villagers have started a sustainable tourism project. The aim is to bring tourists in contact with Javanese village-life. You will have time to look around at a leisurely pace in order to really get to know the daily life. You will go on a tour around the countryside by local horse-car (angdong). You drive across plantations where people are working and you will stop regularly. This interesting tour is concluded with a traditional Javanese meal served in one of the local houses. After the tour we go back to Yogyakarta for Overnight. In the afternoon we leave for Prambanan. En route we will visit Kota Gede, home to workplaces that manufacture beautiful silverware. Prambanan is a Hindu complex of temples. This is a wonderful place to see the sunset, sitting on one of the temples. This evening you can enjoy a lovely Indonesian buffet (included in the price) followed by the Ramayana ballet. Today is a long drive. We drive via Solo, a royal city by tradition and famous for its dancing and wayang puppetry. You can briefly visit the kraton and pasar Klewer, the famous Javanese antique market. We continue towards Malang, where we arrive in the late afternoon check in at your pre booked Hotel. Malang used to be a popular destination for the Dutch in colonial times. You can still experience the colonial atmosphere in town. Overnight stay at the Hotel in Malang. In the morning you can go for a stroll or use a becak to see Malang with its old colonial buildings and the market. Driving out of town into the mountains you can visit a tea plantation. You’ll be guided around on the plantation and inside the factory. You continue towards Mount Bromo, where your hotel is situated at the crater-rim. It has fantastic views of Mount Bromo and the crater and you will really feel like you are in another world! Upon arrival in Bromo check in at your pre booked Hotel. Overnight stay at the Hotel in Bromo. An early start to catch a spectacular sunrise at Bromo’s crater-rim. You can reach the rim by foot, by horse or by jeep. If the first sunrays break through the sky you will have the feeling you are standing on the moon! We return for breakfast.After breakfast leave by Private Vehicle for Kalibaru. Upon arrival in Kalibaru check in at your pre booked Hotel. The peaceful hotel in Kalibaru is situated on a former plantation. The hotel has a beautiful pool and serves delicious Javanese food, a great place to unwind.Overnight stay at the Hotel in Kalibaru. After breakfast We climb into the mountains. Upon arrival in Ijen check in at your pre booked Hotel. Here lies a luxurious resort situated on the edge of the Ijen National Park. It has a beautiful view over the rice fields and the volcano. This is a haven of peace and quiet. The volcano has a giant caldera that is 20 km wide at some points. There is a blue lake inside and on its shore there are numerous sulfur-wells. Every day porters descend into the caldera to get sulfur and carry it downhill. Some of them carry up to 120 kg! Overnight stay at the Hotel in Ijen . Early in the morning you leave for pos Paltuding to climb Ijen volcano. It’s not an easy climb but if you stick to it you will be rewarded. Maybe it helps to think of the porters that descend to the sulfur mine every day and have to climb up with heavy loads. The climb takes about 2,5 hours. After breakfast leave by Private Vehicle for Lovina. Upon arrival in Lovina check in at your pre booked Hotel. We descend to the coast and take the ferry to Bali. Swim in the pool or the sea, take a walk around Lovina or Just laze at the hotel.Overnight stay at the Hotel in Lovina. En route it is possible to visit a colorful market in Singaraja. We can stop at the rice-temple Pura Beji, the monumental Meduwe Karang temple and Pura Ponjok Binu. A secondary road leads through spectacular scenery. Sembiran, a small traditional village, leads to Lake Batur at an altitude of 1.200 meter (3500 feet). On the banks of this lake is a hot water pool. 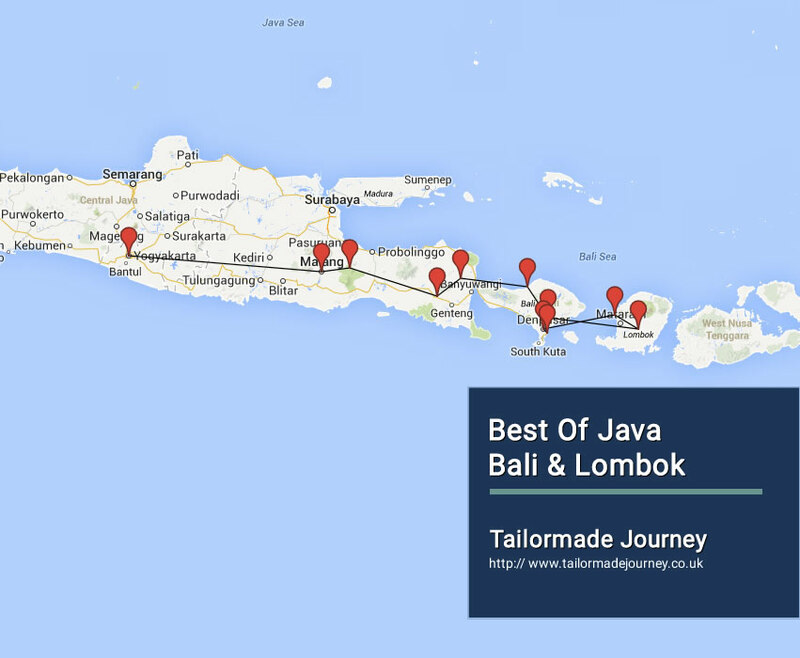 The East of Bali is rarely visited although here you find the best rice-terraces, temples and traditional villages. Today we make a day-tour to this interesting area. We will visit the tranquil water-palace of Tirtagangga and walk through the traditional Bali Aga village Tenganan where they weave the valuable double-ikat. You will stop at the palace of Klungkung with its special paintings and enjoy the fantastic views of the rice-terraces and Mount Agung. Today you are transfer to Denpasar Airport to Short Flight for the neighboring Island. Upon arrival in Lombok you are met and transferred by Private Vehicle for the idyllic Qunci Villas. This is ‘The’ Boutique hotel of Lombok, a beautifully landscaped beachfront property. The large beachfront swimming pool is perfect for relaxation and enjoying the spectacular Lombok sunsets with Bali’s Mount Gunung Agung as the idyllic backdrop. Overnight stay at the Hotel in Senggigi. Towards the north coast of Lombok you find the Gili-islands. These are the bounty islands from paradise! Beautiful white beaches, crystal clear blue sea and a colorful coral reef stretching for a few kilometers starting right off the beach. On the islands, all transfer is done by traditional cidomo, the horse-drawn cart that gives the islands an exceptional laid-back atmosphere. During this daytrip we transfer you to the harbor where you will board the boat that is yours for the rest of the day. This is the ideal way to find the most beautiful snorkel spots. You can have lunch in a restaurant on one of the islands. Overnight say at the Hotel in Senggigi. Your Private Car and Driver pick you up from your hotel. Today you will have a taste of local life. In East-Lombok the traditions of the Sasak, the original population, are still very much alive. From Senggigi we drive towards the Rinjani mountain. During this trip you observe a number of interesting and non-touristic handicrafts. We visit a small-scale bamboo-workshop and you can see how the famous Lombok pottery is made. In a weaving village there will be a delicious Sasak lunch prepared for you. After lunch you can look around and see for yourself how the woman weave the colourfull fabrics at home. In the afternoon a very special dance is staged for us. We will be greeted as special guests in the village and everybody will join us to watch. Today you are transferred to airport to board Flight for Bali. Upon arrival in Denpasar Airport you are met and transferred by Private Vehicle for Sanur. Upon arrival in Sanur check in at your pre booked Hotel. Sanur, Kuta’s peaceful alternative. The beach with its calm waters and the atmospheric boulevard with shops and restaurants are a pleasant setting for a good end of your holiday. It is nice to swim in the sea at high tide, when the sea is calm. There are also a number of activities like windsurfing, parasailing and canoeing in which you can partake. It is also possible to visit an amusement park or zoo, not to far from Sanur.Overnight stay at the Hotel in Sanur. Today you are transferred to the airport to board Flight for you onward Journey.